If you are experiencing back pain, the cause of this back pain may be stemming from pressure due to bulging or herniated discs in your spine. Spinal Decompression works to relieve this pressure, by gently stretching the spine, reducing this pressure which will in-turn, relieve you of your chronic back pain. 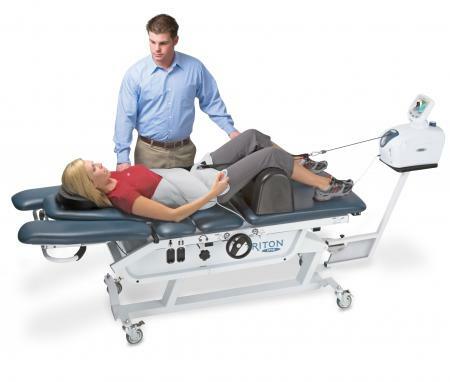 Triton DTS package offers a complete system with a uniquely engineered spine table, a sophisticated traction unit, and simple harnessing with Quik-Wrap™. The system is further accessorized with a cervical traction attachment, knee bolsters, and pressure biofeedback device. Surface EMG activation initiates the session when patient relaxes to the EMG target.